Kick off your next happy hour with a round of these gorgeous Bourbon Aperol Cocktails! Changing seasons mean shaking up our cocktail routine. Out goes the gin and tonic and in come the old fashioned. But that doesn’t mean you have to give up on your favorite summer flavors entirely. 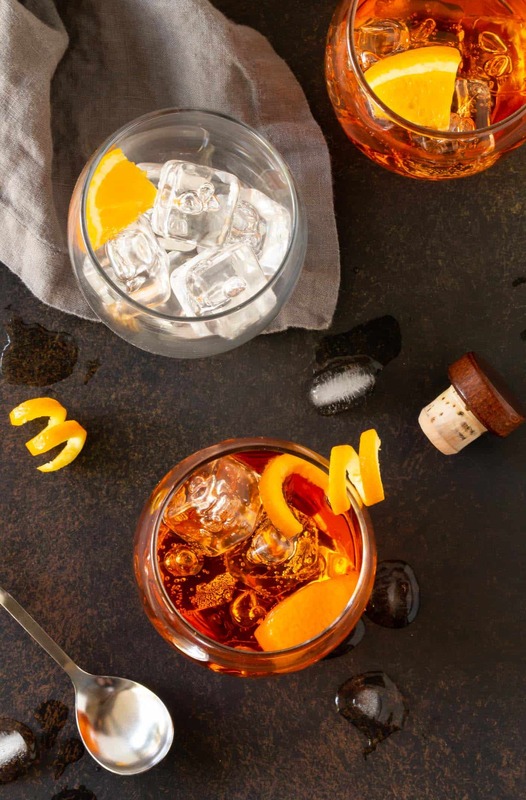 Just add a seasonal twist to them like we did with these super-sippable Bourbon Aperol Cocktails! 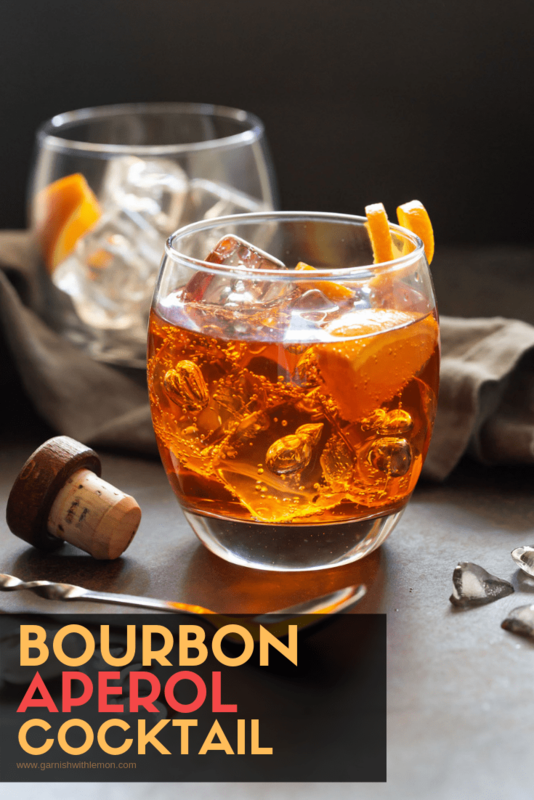 The bourbon lends a bit of heft to what would otherwise be a lighter cocktail made from tangy Aperol, bubby Prosecco and a splash of simple syrup – a perfect meld of flavors to match the change in the seasons. You’ll definitely find these Bourbon Aperol Cocktails making an appearance at our Thanksgiving Day feast. They will pair perfectly with our pre-meal grazing, including munchies like these mini Cranberry Cheddar Cheese Balls. But why limit these beauties to just special occasions? I’d definitely whip up a batch of these for friends and family coming over to watch the big game. Or even as a tasty twist on an eye-catching orange Halloween cocktail. Aperol is an bright orange-hued Italian aperitif. Its low alcohol content (11%) makes it the perfect sipper to help stimulate the appetite before a meal. Most people don’t drink Aperol straight up because of its unique flavor (think slightly sour orange, tart rhubarb and a bit of herbs all mixed together). 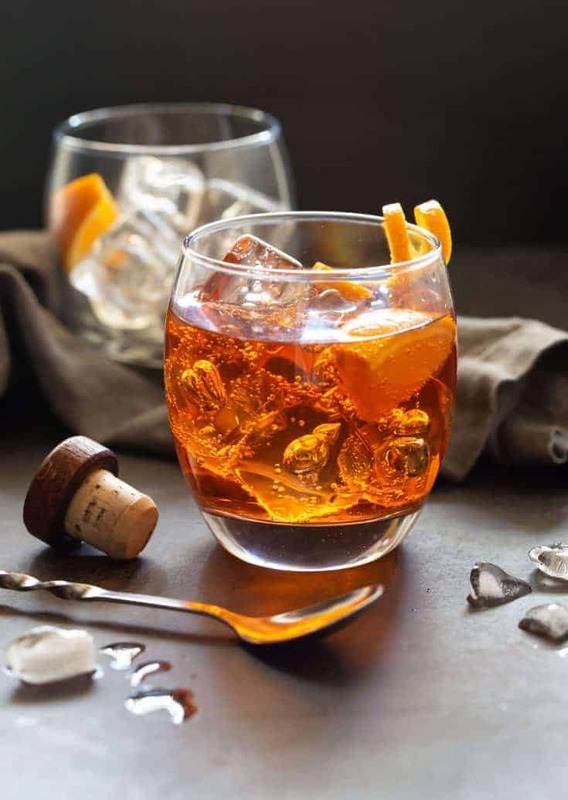 Instead Aperol is mostly used in combination with other wines and/or spirits in cocktails so you get just a hint of the mandarin flavor in harmony with other ingredients. So what other cocktails can I make with Aperol? 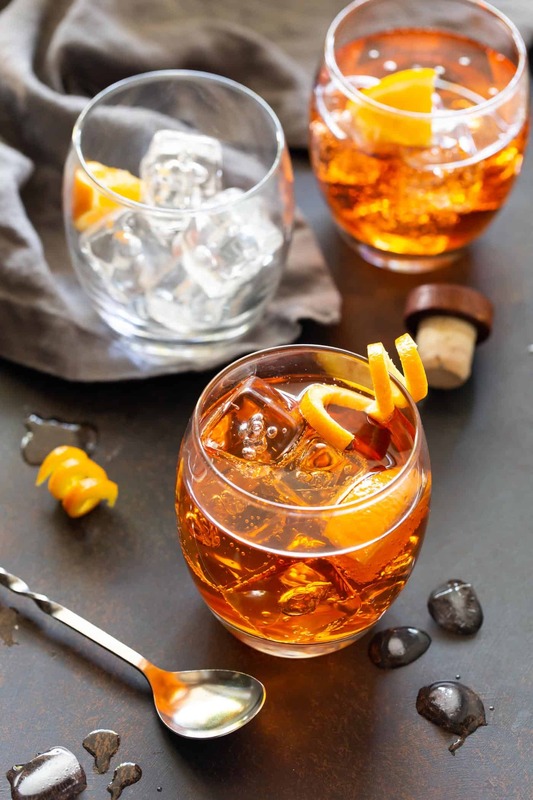 The most popular cocktail to make with Aperol is an Aperol Spritz, espe. This drink has only three ingredients – Prosecco, Aperol and a hint of sparkling water. But Aperol’s low alcohol content also makes it a good mixer with gin, too, like in our popular Aperol Gin Cocktail. Do I need a special type of bourbon for this Aperol cocktail recipe? Not at all! I used a “fruitier” bourbon (Four Roses) for this Bourbon Aperol Cocktail to complement the orange wedge and orange twist, but feel free to use your favorite bourbon/whiskey brand. How do you make the fancy orange twist for this cocktail? Cut a thin slice of orange. Carve out the interior fruit, leaving the rind and a bit of the pith intact. Make a small cut in the rind so it is no longer a circle and you have one long piece of rind. At this point you can trim the size of the rind to make a smaller twist or leave it long for a larger twist. Tightly twirl the rind around your finger, a pen or even a chopstick and hold together for a few seconds to help the rind retain its shape. If you find your twist isn’t staying in a curled shape, try cutting off a bit more pith to make the rind more malleable. Not into fancy garnishes? No worries. You can just add a wedge of orange to each cocktail and call it good. Jump start your next happy hour with a splash of color and a round of these eye-catching Bourbon Aperol Cocktails. This is one signature cocktail that never fails to impress. The gorgeous orange hue of these bubbly Bourbon Aperol Cocktails is sure to kickstart any party. Place bourbon, Aperol and simple syrup in a lowball glass filled with ice. Squeeze and drop orange wedge into glass. Top with Prosecco. Stir gently to combine. Garnish with orange twist, if desired. Serve immediately. Why do so many cocktails include simple syrup. I find it annoying to have to add sugar to things in general.